Summer can be a rewarding season to have a suitable bird buffet in your backyard, and these summer bird feeding tips can help you attract a varied flock of feathered friends. By understanding the needs birds have in the summer and how to meet those needs with the most nutritious foods, backyard birders can be sure all their summer guests have a great diet. Long days give backyard birders more time to observe feeders and see many different hungry visitors. Birds are in their breeding plumage during the summer months, making identification easier and more enjoyable with bright colors and clear markings. Birds are raising their families, giving backyard birders the opportunity to watch nestlings mature as they learn to visit bird feeders. There is a greater variety of birds in northern areas during the summer months, and birders who only offer food in the winter will miss many amazing species. At first it may seem that fewer birds visit feeders in early to mid-summer, making the season less desirable for backyard birding. During early summer, however, many birds are nesting and are naturally more secretive, and while their chicks are very young these birds visit feeders only briefly. Furthermore, this is the time of year when many natural food sources – fruits, insects, seeds, etc. – are more readily available, decreasing birds' use of feeders. Persistent birders, however, can enjoy a bounty of summer birds by ensuring their feeders are filled with nutritious treats. Offering a variety of nutritious foods is the best way to attract feeding birds in any season. During the summer months, many birds also eat fruits and insects in addition to popular seeds, and offering a wider range of choices at the feeder will attract more species. Seed: All types of birdseed are suitable for summer fare, but black oil sunflower seeds, hearts or chips are the most popular option for a wide range of bird species. 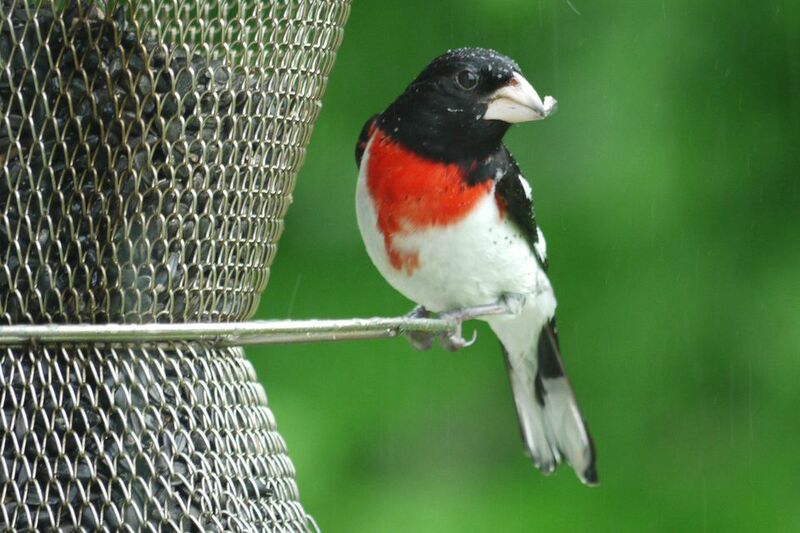 Nyjer will also attract finches, while mixed seed caters to different songbird species. Fruit: Many songbirds eat fruit. Apple chunks, banana slices and orange halves will attract orioles, northern cardinals, gray catbirds, summer tanagers and other colorful birds. These foods can be offered in a platform feeder or used to fill a suet cage for easy hanging. Jelly: Just like fruit, jelly is a sweet treat for many birds. Both apple and grape jelly can be used to attract woodpeckers, American robins, gray catbirds and orioles. Small dishes of jelly are best, to be sure it doesn't go rancid or moldy in the summer heat before birds consume it all. Nectar: Hummingbirds are the most popular types of birds that enjoy nectar, but orioles, woodpeckers and nuthatches have also been known to sip at sugar water feeders in the summer. In addition to nectar feeders, plant a variety of nectar-rich flowers for an abundant natural food source. Mealworms: Insect-eating birds will appreciate mealworms at backyard feeders, particularly when they need to supply hungry nestlings with dozens of insects each day. Mealworms are especially attractive to bluebirds, wrens, grosbeaks and warblers. Fresh mealworms are best, but dried mealworms can also be added to seed mixes for birds to enjoy. Peanuts: Shelled or whole peanuts are popular with jays, chickadees, titmice and nuthatches, and they can be offered in platform feeders, small dishes or specialized peanut feeders. Small bits of peanuts can also be added to seed mixes. Avoid seasoned, flavored or coated nuts, however, which are unsafe for wild birds. Suet: It may seem contrary to offer suet during the heat of summer, but no-melt suet mixes (made with less fat) will attract woodpeckers, chickadees and jays. They are a great source of energy during busy summer days of caring for hungry nestlings. Suet can also be crumbled, chopped or shredded and offered in small dishes. While a greater variety of foods will attract more birds, backyard birders should take care not to offer less nutritious options during the summer when baby birds need the best food for healthy growth. Kitchen scraps, for example, are not suitable to feed birds during the summer. While small quantities of bread, cooked rice and other scraps won't harm adult birds when offered as very rare treats, these foods offer no nutrition for nestlings and other young birds. Avoid offering this "bird junk food" during the months when young birds need a healthy diet to grow into strong, mature adults. Peanut butter that will melt quickly and could damage birds' plumage when it sticks to their feathers. Peanut butter can also go rancid very quickly on hot days. Soft suet blends that will not withstand the summer's heat and instead will spoil or melt quickly, growing mold or fostering bacteria that can be dangerous to birds. Overly large quantities of nectar for hummingbirds or orioles that are more likely to spoil and ferment before the birds can drink it all. While summer can be a great season to feed the birds, it can also be problematic. Other animals, including rats, mice, raccoons, deer and bears may visit backyard feeders hoping for an easy meal, and different foods can quickly spoil in summer heat and humidity. To counteract these problems, check that each bird feeder is operating correctly without loose ports or broken hinges that would invite pests to dine. Only put out enough food that can be eaten in 1-2 days, and consider putting feeders in a secure shed or garage at night to deter other animals if necessary. Check seed regularly for mildew, clumps or spoilage, and keep feeders clean to prevent spreading diseases or parasites to other birds or humans. If unwelcome guests do become a problem, it can be best to remove all bird feeders for a few days. The birds will find other food sources and other pests will also move on to different foraging areas. After a week or two, the feeders can be put out again and the birds will quickly return. Keep feeders in shaded areas to minimize spoiled seed and help birds keep cool, encouraging them to feed longer and visit more frequently. Choose mesh or open feeder styles that will dry out quickly if seed gets damp, and use baffles or covers to keep seed from getting soaked in summer rainstorms. Decrease the quantities of millet or cracked corn to attract a greater variety of birds instead of just house sparrows, European starlings and brown-headed cowbirds. Keep cats indoors and take steps to discourage feral cats in your yard to protect ground feeding birds and immature fledglings just out of the nest. Protect birds from window strikes by positioning feeders correctly and using anti-reflective techniques to make windows more visible. Add a bird bath for a fresh water source that will attract not only feeding birds, but also species that need water but do not frequently visit feeders. Summer is a great time to feed the birds, and with the right summer bird feeding techniques it is possible to enjoy dozens of beautiful bird species right in your backyard.